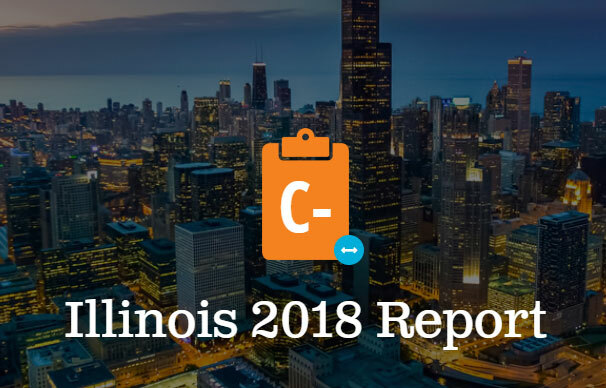 Chicago — The Illinois Section of the American Society of Civil Engineers (ASCE) released the 2018 Report Card for Illinois’ Infrastructure, giving 10 categories of infrastructure an overall grade of C-. The report includes an evaluation of the state’s aviation, bridges, dams, drinking water, navigable waterways, ports, rail, roads, transit, and wastewater. Aviation and rail both received the highest grade of C+, while navigable waterways received the lowest grade of D-. The report is an update from one released in 2014, which gave the same overall grade. “There was little improvement over the past four years. Illinois’ infrastructure has been on a starvation diet, plagued by years of budget impasses, unpaid bills, pension crises, and a lack of focus from our elected officials. It’s time to make our roads, drinking water, dams, and other infrastructure a priority again,” said Darren Olson, co-chair, Illinois Infrastructure Report Card Committee. Airport infrastructure needs have increased 32% since 2015 and Illinois has a projected funding need of more than $5 billion over the next five years. There are an average of 9 million trips across the 2,303 structurally deficient bridges in Illinois each day. More than 50% of the dams in the state are over 50 years old, and within four years, nearly 80% of Illinois dams will be over 50 years old. Strain on aging drinking water infrastructure results in water main breaks and leaks that lose as much as 30% of the treated water supply in the Chicago area. Given the 94 million tons of freight shipped annually, failure of just one of the critical locks on the navigable waterway system can cost more than $1.5 billion annually in additional transport costs and the loss of more than $2 billion in farm-based income. The state’s rail network is over 7,000 miles long and Illinois is the only state in which all seven Class One freight railroads operate. Illinois’ 19 cent-per-gallon motor fuel tax has remained the same since 1991 while roads in need of repair costs Illinois motorists $4.8 billion a year in extra vehicle repairs and operating costs, or $566 per motorist. Consistently pass balanced budgets and develop new sources that provide adequate long-term sustainable funding for infrastructure. Consider emerging technologies and shifting social and economic trends as we design our future infrastructure with clear economic, social, and environmental benefits in mind. The Report Card for Illinois’ Infrastructure was created as a public service to citizens and policymakers of the state to inform them of the infrastructure needs in their community. By using school report card letter grades, civil engineers used their expertise to condense complicated data into an easy-to-understand analysis. ASCE State Infrastructure Report Cards are modeled after the national Infrastructure Report Card, which gave America’s infrastructure a grade of D+ in 2017. The full Report Card for Illinois Infrastructure is available at https://www.infrastructurereportcard.org/state-item/illinois.